Pistachio Cream Doughnuts – Super fluffy yeast doughnuts are tossed in powdered sugar and filled with homemade pistachio pastry cream. These doughnuts are going to be your family’s new favorite breakfast treat! Happy Labor Day! How are you enjoying the day? We’ll be hitting up the pool this afternoon celebrate a friend’s birthday and eat our faces off, per the usual. I’m just happy to enjoy one last hurrah out in the sun before it’s officially Fall. Only one more month! I’ve already started dreaming up some killer recipes perfectly for the Fall, including another macaron recipe, some comforting soups, and my first baked doughnut! Speaking of doughnuts, I got a yummy yeast doughnut for you today. I am a huge fan of yeast doughnuts because they’re so chewy and light. But it’s hard to get them to crispy on the outside by just baking them, so unfortunately there is no getting around the frying. But frying doesn’t have to be such an intimidating experience. The thing that always worried me the most was now knowing when the oil was hot so I’d always have soggy fried food. But that changed after I got a candy thermometer to ensure I was always frying at the right temperature. Today’s version of yeast doughnuts is made with one of my newest obsessions: pistachios. I had never tried pistachio anything until I met my husband – green nuts just didn’t sounds like something I’d like. But I had no idea they had an almond-like flavor, which I LOVE. After I tried pistachio gelato, I was hooked. Gimme pistachio everything! So I added some chopped pistachios to a pastry cream and used that cream to fill up some classic yeast doughnuts and voila – my Pistachio Cream Doughnuts were born! Now, I love a great, easy recipe. Sometimes you just want some breakfast and you want it fast. But I gotta warn you: this is not one of those recipes. There are a few more steps to these doughnuts than you may be used to, but they are sooo worth the effort. Plus, it’s great therapy for days when you just want to take some stress out in the kitchen. And did I mention there is pistachio filling?! It’s not your average custard filling. I am much more inclined to make a recipe that requires a little more effort if it’s something totally unique and not available unless I make it myself. To make these doughnuts, you’re gonna use the same dough recipe from my blackberries & cream slider doughnuts. Remember those? They were so light and fluffy but with a slight crisp on the outside. The recipe was so perfect so there was no need to change it up for these doughnuts. For the filling, we’re making a pastry cream. Pastry cream is the same as custard, essentially, but it’s what we call the filling in eclairs, Boston creme pie, and Napoleons. The recipe is simple: heat milk, add to eggs, sugar, and cornstarch. Then, we thicken the mixture over heat into a custard. Finally, you finish off the custard with a pat of butter, vanilla and almond extracts, and a pistachio paste. For the pistachio paste, all you need to do is blend the pistachios with water in a food processor. That’s it! But if there’s one tip I have for you regarding the pistachios, it’s to buy them already shelled. I thought it would be easy to shell them myself and save some money. But OMG, shelling that many pistachios is ANNOYING. It took forever and I got sore fingertips from opening about a million shells. Do not roll out the dough too thin when cutting the doughnuts. If the doughnuts are too thin, they won’t expand properly in the hot oil and you’ll have flat, dense doughnuts. You don’t need a deep fryer for these doughnuts. I simply use my cast iron dutch oven and a candy thermometer to help me. And while I’m talking about frying, you don’t need to fill the whole dutch oven with oil – 1/3 full is perfectly enough oil to fry these doughnuts. Make sure you chill the pastry cream long enough so that it can thicken up. It’s hard to fill these doughnuts when the pastry cream is thin – so messy! Doughnuts are tough to make ahead of time. But there are things you can make the night before if you want to save time. You can make the dough and let it rise once the night before. Punch it down and then put it in the fridge overnight. Remove from the fridge about 30 minutes before using to let it get to room temperature and then roll out and cut into doughnuts. You can also make the pastry cream the night before and let it chill in the fridge overnight. There you have it – the best way to enjoy pistachios for breakfast! You’re gonna love these doughnuts! See you on Thursday for another yummy breakfast recipe! 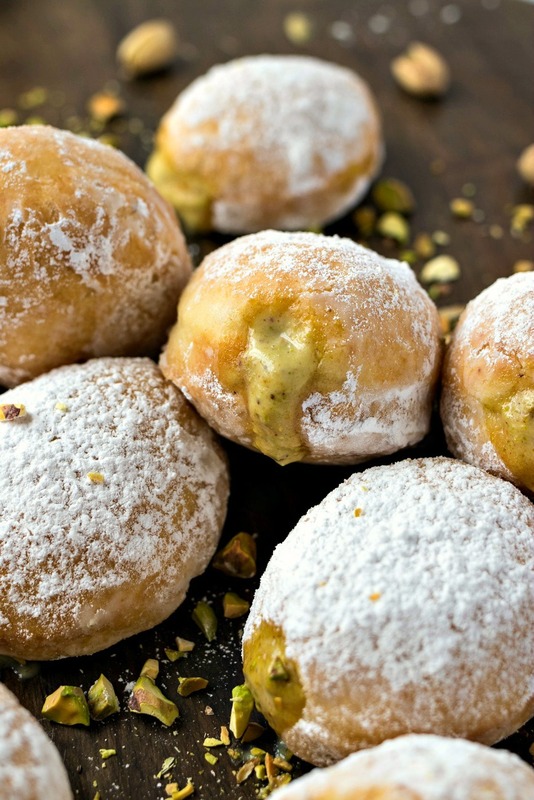 Super fluffy yeast doughnuts are tossed in powdered sugar and filled with homemade pistachio pastry cream. These doughnuts are going to be your family's new favorite breakfast treat! Heat milk in small saucepan over medium-low heat, until small bubbles form around the edge of the milk. Remove from heat and add 2 tablespoons of sugar and 1 teaspoon of salt. Stir to combine and set aside to cool. Add yeast packet and warm water to a small bowl to activate the yeast. Let it sit, untouched, for 10 minutes. You should see a layer of foam on top of water after the time is up. If not, that means your yeast is dead and you need to use cooler water or buy a newer packet. Add milk to a large bowl with 2 1/2 cups of flour, 2 tablespoons of oil, eggs, and yeast mixture. Mix together with a wooden spoon until mixture is combined. It will be thick, but still wet and sticky. Add remaining 1 cup of flour to a clean counter. Pour yeast batter onto flour and knead together until completely combined. Add more flour if batter is too wet and keeps sticking to the counter. Knead dough for 4-5 minutes until dough is smooth. Place into a large bowl with a little vegetable oil to keep from sticking. Cover with a towel and let the dough rise for 1 1/2 hours. While dough is rising, make the pastry cream. Add milk to a medium saucepan and heat to a simmer. Turn off heat. Add eggs, cornstarch, and sugar to a small bowl and whisk until completely combined. Add a little of the warmed milk and whisk together. Slowly add the rest of the milk as you whisk slowly. Pour mixture back into saucepan. Place saucepan with mixture on stove set to medium-high heat. Stir constantly until mixture begins to thicken, like pudding. It happens pretty quickly so make sure you're paying attention. As soon as the mixture is the consistency of pudding, remove from heat and transfer to a small bowl. Add butter, salt, vanilla extract, and almond extract and stir together. Add pistachios and water into a food processor. Blend until pistachios are crushed and in the form of a paste. Add to pastry cream and stir together until combined. Place a piece of plastic wrap on top of mixture and refrigerate for 3 hours so it can chill and thicken. Once the doughnuts are cool to handle, take a sharp knife and insert it through the top edge of the doughnut through the middle but don't let the knife get all the way through. This is to help create a tunnel for the pastry cream. Place chilled pastry cream in a pastry bag fitted with a rounded tip. Place tip of the pastry bag into hole of the doughnut. Gently press on the bag to push the filling into the doughnut. You'll start to feel the doughnut fill up. Once it's full, a little cream will poke out of the hole. Remove pastry bag and repeat with remaining doughnuts. Serve immediately. Doughnut will only stay good for the day. These look amazing! I have a question – Your recipe says 1 packet of yeast, can you provide this measurement in grams/spoon/cups? It’s just that the packet sizes vary in different stores, it would be helpful if you could provide the exact measurement instead. Thanks so much! Cant wait to make these! Sure- 1 packet of yeast equals 2 1/4 teaspoons. Sorry about that! I’m going to die. In a good way. This is my dream recipe! Yay! I am so glad you love it too. Pistachios are my everything so I’m excited to bake more with them! Wow okay, these sound crazy good! I would love to have one right now! I love pistachio flavored anything! These look right up my alley! So delicious! I am totally drooling for these donuts right now! Looks amazing! These look amazing! I love yeast doughnuts, too — my dad used to make the best! I had a fabulous pistachio cream w/ some pastries when I was in Italy, and your goodies remind me of those. What a treat! Omg yes! Even more of a reason to head to Italy!! Thanks Patricia! Another awesome recipe I have never seen any like these before! These sound delicious! I’m definitely going to try them out sometime! Wow! I’ve never seen donuts quite like these before. They so perfect on the outside and gooey on the inside. Such a great recipe, thanks for sharing this. I know right?! Thanks for stopping by! This is truly blissful and heavenly. Looks absolutely inviting. Helloooo delicious little babies!! These look seriously amazing- a must-try for sure. Thanks for sharing! Thanks, Karly! Anything with pistachios drives me wild! Girl you got this! Baking is about patience and having fun. Let me know if you run into any issues and I’ll help as best I can! Thanks so much! Love your blog name! I love pistachios! I’ll have to save this recipe! I love this idea! I have a recipe for homemade doughnuts but haven’t tried filling them with anything yet. Oh perfect!! You can still use your own doughnut recipe and just use this recipe for the filling. Let me know if you try it out! Woohoo! That’s what I like to hear! Make sure you give mom tons of love if she makes them for you!! I recently discovered that I love pistachio! I am excited to give this a try. I’ve never had pistachio donuts before – they sound really good!! What a creative idea! I had never considered a pistachio cream as a doughnut filling, but these sound incredible. Your photographs are really appetizing! OMG! Those sound amazing! I am salivating over here!